‘At Twyford St Mary’s CofE Primary School we believe in educating the whole child. This means valuing each individual by supporting and nurturing academic, personal, emotional and social development’. Our recent Ofsted inspection reported that teaching at TSM is at least good and in some cases outstanding. How are Special Educational Needs identified ? 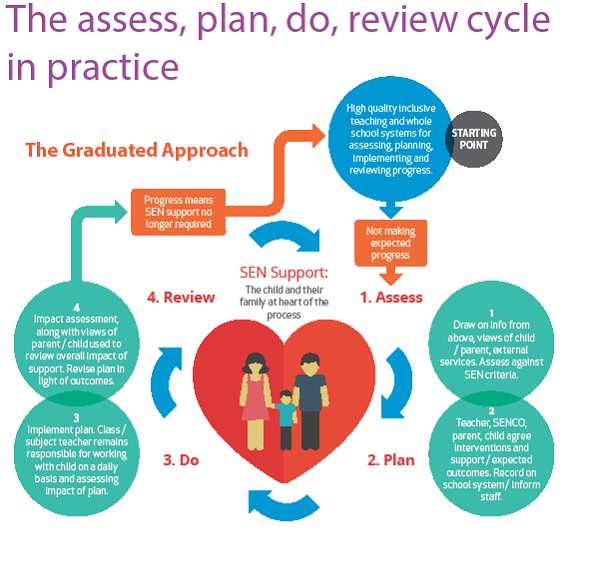 At TSM we follow the guidance provided by the SEND Code of Practice 2014 to identify learning needs and difficulties and to put in place appropriate support. We follow the ‘Graduated Response’ approach. This model shows how we identify a Special Educational Need or Disability (SEND) and how we intervene, monitor progress and plan. Children who are identified as having a SEND are placed on our school SEND register as SEN Support. Some children make very good progress, or their needs change, and so may no longer need to be registered as SEN Support ; these children will continue to be closely monitored through class action plans. Some children have a greater level of need, in which case a request for an Education and Health Care Plan (EHCP) put together with the school, family, child and outside agencies will be sent to the LEA . If successful, these children will have allocated 1:1 support hours linked to their EHC Plan and are supported in school by a 1:1 Learning Support Assistant ( LSA ). concerns raised by the Class Teacher, parents, Support Staff, Headteacher and SENCo. a child performing significantly below age related expectations. assessment and screening tests, which may include the New Salford Reading Test, the Neale Analysis of Reading Ability , the Vernon Spelling Test, the Helen Arkell Spelling Test, the Sandwell Early Numeracy test, the British Picture Vocabulary Scale or the Dyslexia Screening Test, to provide a more detailed diagnosis. close liaison with outside agencies and specialist professionals. What does SEN Support mean for my child ? SEND Support is very varied and dependent on the need of the individual child. It will be planned and co-ordinated with class teachers, the SENCo, LSAs, the Headteacher , parents and, where necessary, outside agencies. This liaison will help to inform what provision is needed which is ‘different from or in addition to’ the usual school activities and curriculum. As a school we have excellent relationships with, and are well supported by, many external agencies that we may feel are relevant to individual children’s needs. We work closely with all agencies and parents together. support or resources in the classroom which is different to other children, eg a personal workstation or a laptop to type rather than write. more regular support in class, which may be 1:1 or small group. different outcomes in a lesson. interventions outside of the classroom to support a particular need, eg personalised learning to support a reading, writing or numeracy need, emotional support through ELSA, a movement programme to develop motor skills. support from outside agencies, eg Speech and Language Therapist, Primary Behaviour Support. Parents are kept informed of specific SEND support their child is receiving through meetings with the Class Teacher, the LSA, the SENCo and outside agencies. Individual Education Plans (IEPs) and Action Plans which detail interventions, targets and outcomes are regularly reviewed. Parent consultation meetings are held every Autumn and Spring term. Parents are encouraged to arrange meetings at other times if necessary. Pre-teaching – individual or small group sessions to teach numeracy or literacy skills and vocabulary for a forthcoming lesson. Precision teaching – short, frequent, precise interventions to address individual, specific gaps in numeracy and literacy skills and knowledge. Lexia – an on-line reading programme that can be accessed both at school and home. Sidney – Screening & Intervention for Dyslexia Notably in the Early Years, a highly structured 1:1 phonics programme to develop reading skills. Reading Reflex/Phonographix – an highly structured, 1:1 intervention to help develop the subskills necessary for reading. Toe by Toe – a highly structured multi-sensory reading programme. Stride Ahead – a reading intervention designed to improve and develop reading speed. Stareway to Spelling – an individual/small group , highly structured intervention to develop children’s spelling ability, in particular with the 300 most used words in English. Write from the Start – a programme designed to help individual children develop the fine motor and perceptual skills for fluent, legible handwriting. Write Dance – a programme which helps children to develop the pre-requisite physical skills and co-ordination for writing through music and movement. Speed up – an 8 week kinaesthetic programme to develop fluent handwriting Year 3 and above. Dance mat Typing – an on-line programme to teach children touch typing and keyboard skills. ABC, Clever Bodies and Clever Hands – individual/small group interventions developed by Paediatric Occupational Therapists to develop children’s gross and fine motor skills and to help manage sensory processing difficulties. Thrive – the Thrive approach uses 1:1, appropriate, targeted interventions designed to meet individual emotional, social and mental needs. Cued Articulation – a resource using a set of hand cues for teaching the individual sounds in a word. The Time to Talk – small group activities to develop oral language and social interaction skills. ELSA – individual or small group Emotional Literacy Support sessions with a trained Emotional Literacy Support Assistant (ELSA) to provide emotional support, develop independence, teach friendship skills, improve self- esteem, develop self regulation techniques, teach calming strategies to help manage anxiety and help children to identify and understand their feelings. Lego Therapy – small group work to develop speaking and listening skills and then ability to work in a team.